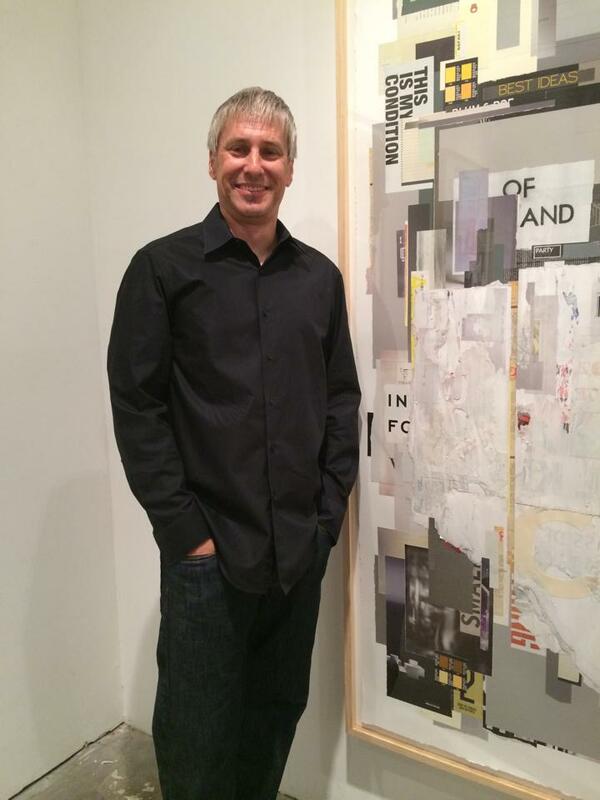 Tm Gratkowski: NOTHING SHOCKING | Jill Thayer, Ph.D.
December 7, 2014 · by Jill Thayer, Ph.D.
By Jill Thayer, Ph.D., Contributing Writer, ARTPULSE Magazine, Miami, Dec. 2014 – Jan. 2015 Issue. 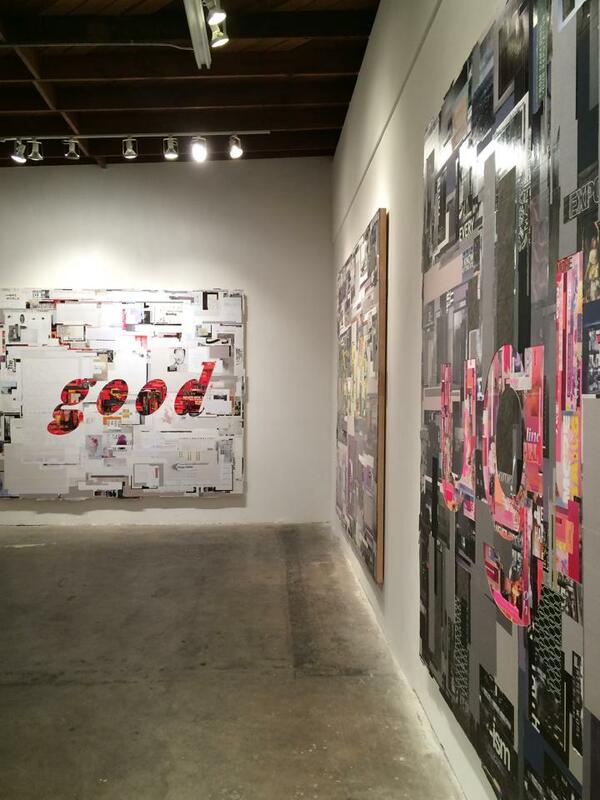 Tm Gratkowski at Walter Maciel Gallery, Los Angeles, installation view of “Good,” “Bad,” and “Ugly,” 2014, collaged paper on paper, 90 x 106 inches each. Photo courtesy Jill Thayer. In our quest to assimilate mass communication in a 24/7 news stream, Tm Gratkowski serves as a cultural observer and social navigator to channel and question the current. 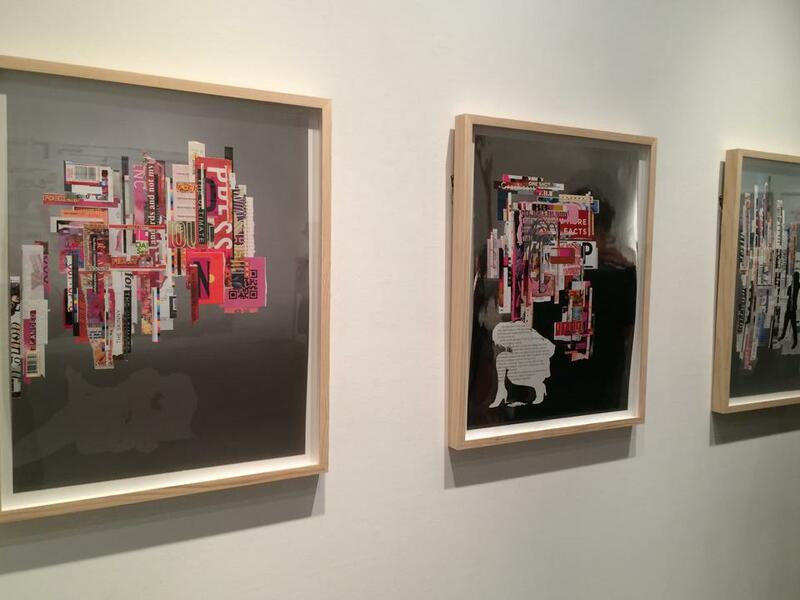 His paper collages and concrete sculptures reveal a subtext of social commentary amidst the white noise of society. 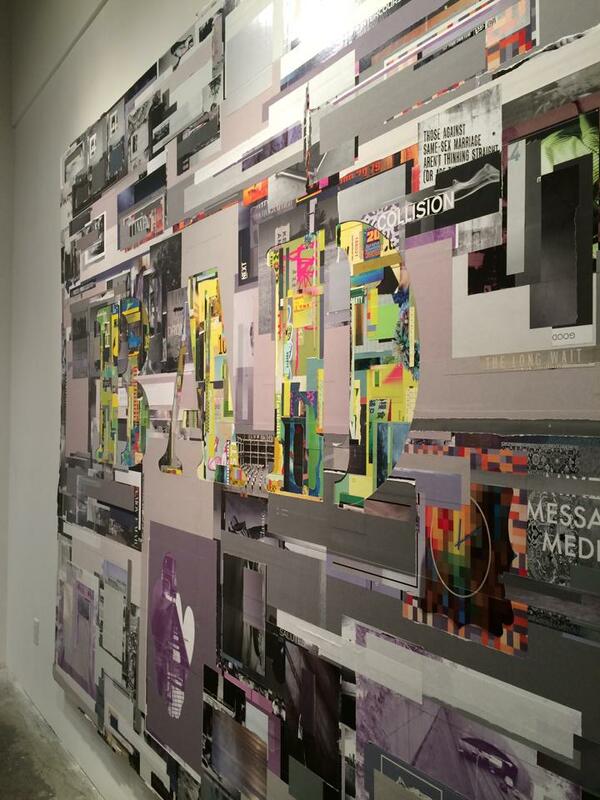 Tm Gratkowski, “Bad,” 2014, collaged paper on paper, 90 x 106 inches. Photo ©2014 Tm Gratkowski, courtesy Walter Maciel Gallery. Identifiable in syntax over time, the meaning of the words becomes inconsequential. “Bad,” is cut out and centered on superimposed images of warm and cool greys. “TIME,” “NEXT,” “COLLISION,” “SALUTES,” “CLASSIC,” “SOLUTIONS,” “BIG OIL,” “INTERCOURSES,” “LOOKING UP,” “DANGER,” and “MESSAGE MEDIA” are words positioned haphazardly that provoke the viewer to define a possible relationship in the juxtapositions. The middle panel, “BAD,” creates yet another layer of inquiry composed with yellow, green, and blue print media. Is “Bad” good or “Good” bad? It’s all in the viewer’s discretion and a matter of context. Gratkowski wants to push people in the understanding of communication and intent. Are these colloquialisms or formal references in the English language? The exhibition includes a series of large vertical panels that explore the power of image over words. 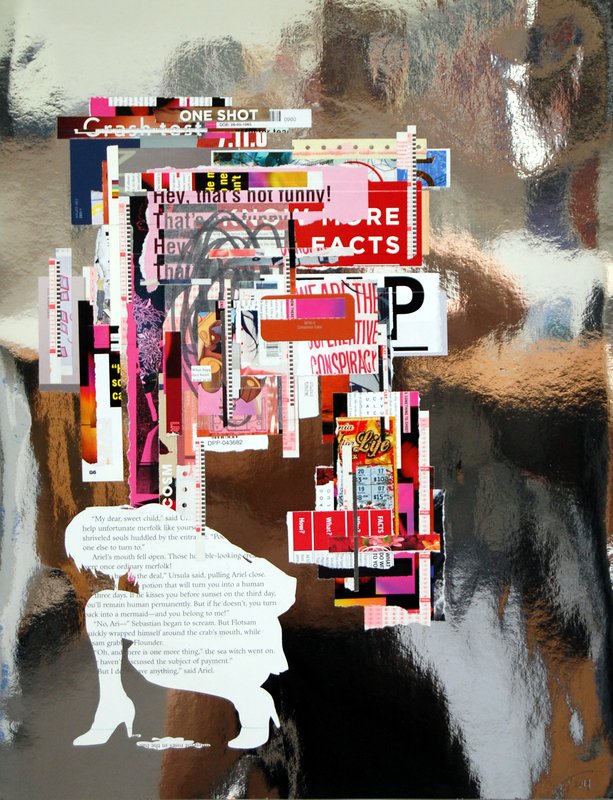 A smaller series displays silhouettes of human interactions and behaviors atop graphic layers of media text with comparisons drawn in the visual sequence of the subjects depicted. In contrast, small sculptural works of paper and pigment concrete from his Paper Crete series occupy the space as the textural dialogue continues. Crumpled paper from his print material is sandwiched between blocks of concrete inviting inquiry, as one might ask… Are we trapped under the weight of a media-saturated culture? Are words used today archaic tomorrow? Is our language compromised by a hierarchical society? Gratkowski’s methodology is truly his own. There are however, tangential references to artists who use text and image to incite public discourse such as Barbara Kruger, Jenny Holzer, Lawrence Weiner, and Ed Ruscha. Their themes engaging signs, symbols, simulacra, hyper-consumerism, commodification, cultural iconography, aphorisms, and linguistic signifiers contribute to our understanding of art and the truisms of culture. Tm Gratkowski, “Cinnamon Crash,” 2014, collaged paper on metallic paper, 25 ½” x 19 ¾”. Photo ©2014 Tm Gratkowski, courtesy Walter Maciel Gallery. The constant change of information and trends in graphics, colors, and stories reflect the nature of the material that the artist sees as evolving. Gratkowski deconstructs our lexicon in a cut and paste landscape of meaning and message while his process-driven works contextualize image and text for the viewer to decipher. In NOTHING SHOCKING, Gratkowski finds nothing unusual about our quotidian misinterpretations or assumptions in a discourse of selective meaning. He does however find that anomaly and disseminates it through a language of visual perception offering engaging narratives in contemporary culture. 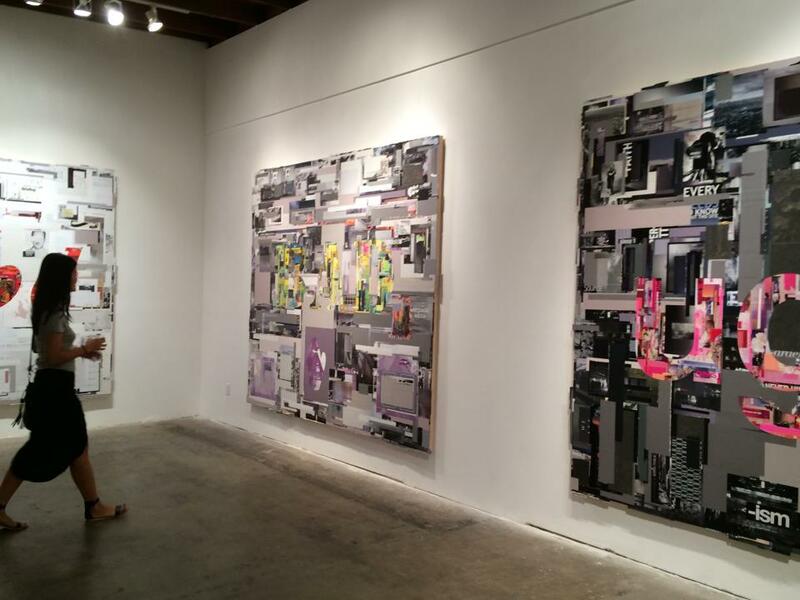 Tm Gratkowski at Walter Maciel Gallery, Los Angeles, “NOTHING SHOCKING,” installation view. 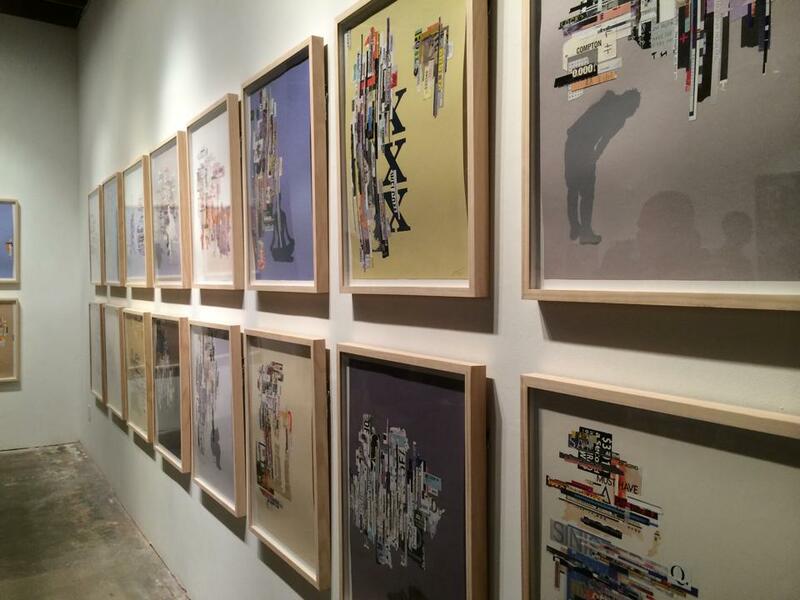 Tm Gratkowski at Walter Maciel Gallery, Los Angeles, installation view of “Beautiful Sinister” 2014, collaged paper & paint on paper, 25 ½” x 19 ¾”. Photo ©2014 Tm Gratkowski, courtesy Walter Maciel Gallery. 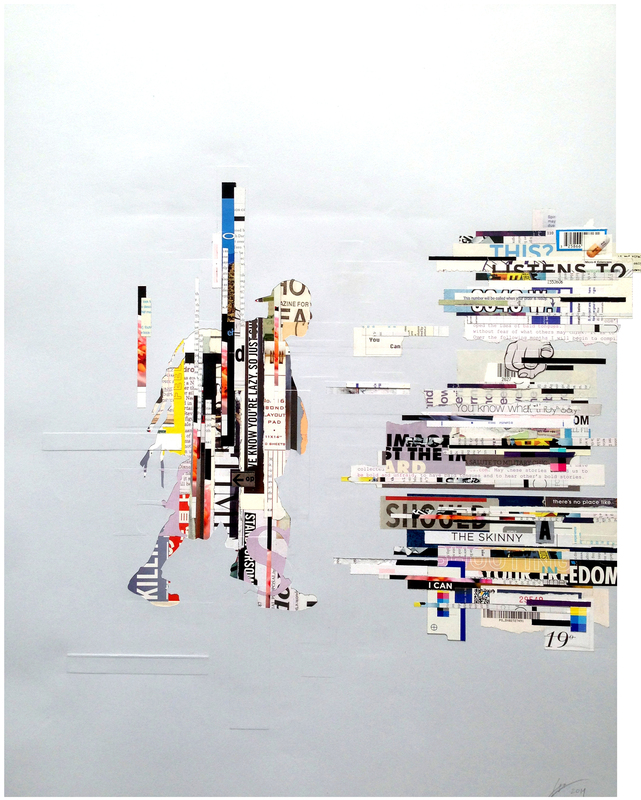 Tm Gratkowski, “Tolerance,” 2014, collaged paper on paper, 73 x 36 inches. Photo ©2014 Tm Gratkowski, courtesy Walter Maciel Gallery. 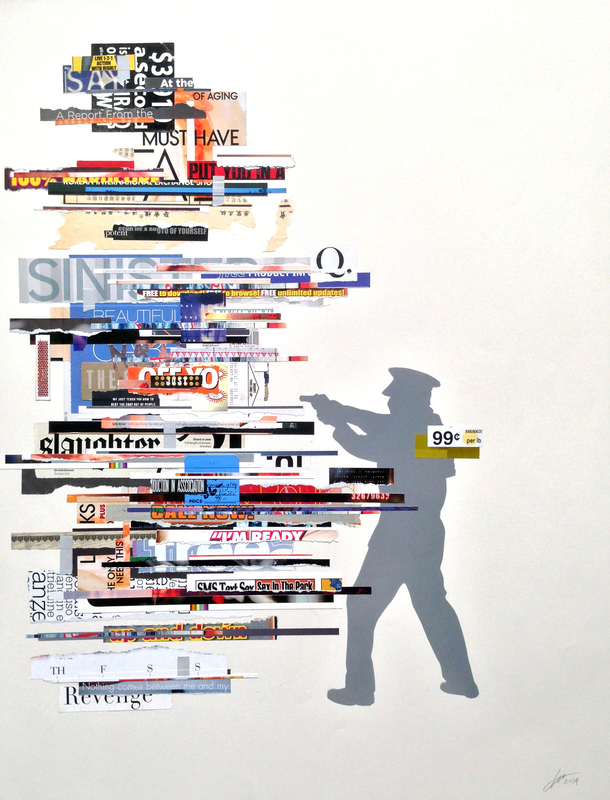 Tm Gratkowski, “Lazy Do,” 2014, collaged paper on paper, 25 ½” x 19 ¾” Photo ©2014 Tm Gratkowski, courtesy Walter Maciel Gallery. 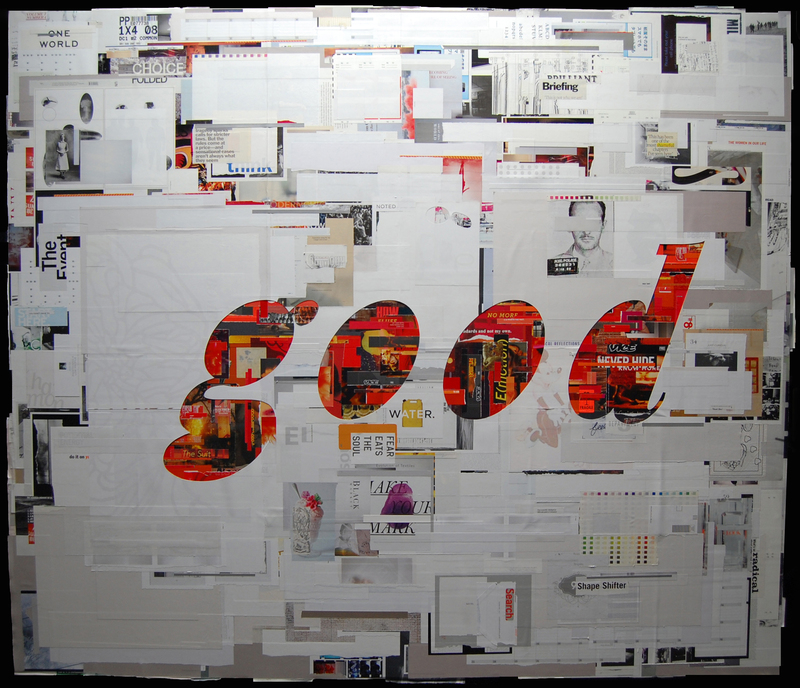 Tm Gratkowski, “Good,” 2014, collaged paper on paper, 90″ x 106″ Photo ©2014 Tm Gratkowski, courtesy Walter Maciel Gallery. 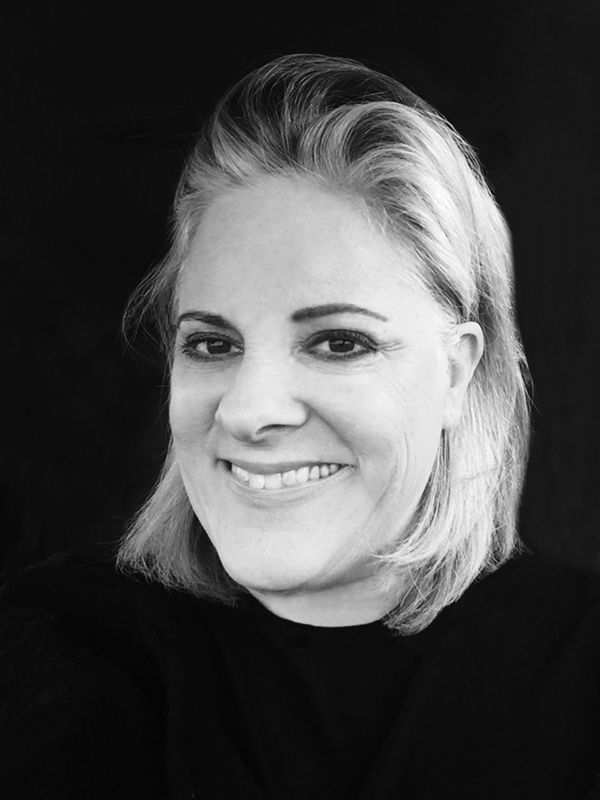 Jill Thayer, Ph.D. is an artist, educator, and curatorial archivist. She is Associate Professor of Art History for Allan Hancock College, Santa Maria, California; and online faculty at Santa Monica College in Art History: Global Visual Culture; Southern New Hampshire University in Humanities/Art History and Marketing; and Post University in the MBA Marketing program for the Malcolm Baldrige School of Business. 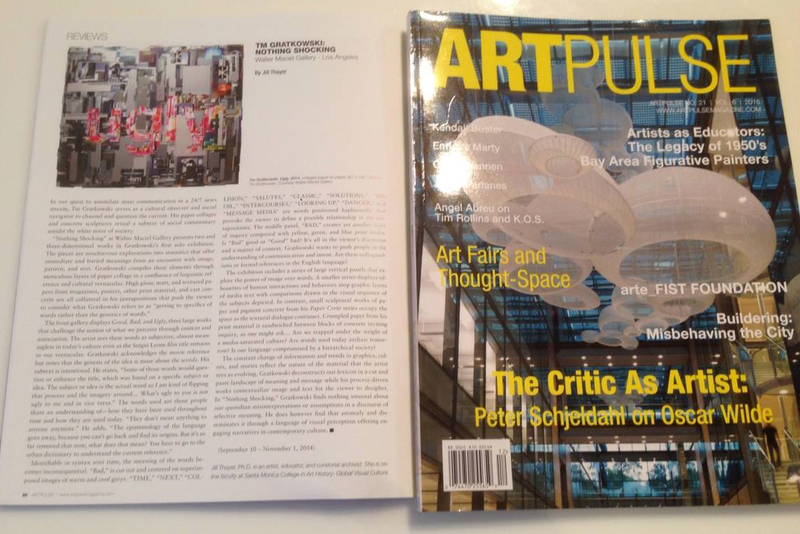 Jill is contributing writer for Artvoices Magazine, Los Angeles; and Artpulse Magazine, Miami. Her postdoctoral project, “In Their Own Words: Oral Histories of CGU Art,” featuring Professors Emeritus, Professors, and Alumni of Claremont Graduate University is included in Archives of American Art at The Smithsonian Institution. This entry was posted in Art History, Artist Emergence, Artist Profiles, Exhibition Theory, Visual Culture and tagged Art, Art Review, Artist Emergence, Artist Profiles, Artpulse Magazine, Contemporary Art, Jill Thayer Ph.D., Tm Gratkowski, Walter Maciel Gallery. Bookmark the permalink.